Fuerteventura is a desert like island known for its good surfing, long stretches of white sandy beaches and high visibility diving. Fuerteventura is the least populated island of the Canary Islands and its name is probably coming from viento fuerte which is Spanish for strong wind. Despite these strong Trade Winds and slightly less comfortable climate, the main reason to visit Fuerteventura is its kilometer long white beaches and high surfing waves. Famous tourist destinations are the Jandia peninsula, the small stretch of land in the south, and Corralejo in the north. You can visit Isla de Lobos (Island of wolves), a beautiful island named after the Monk Seals, often referred to as Sea Wolves. You can enjoy a trip to Nature Parks of Las Dunas de Corralejo, a barren and arid interior, resembling like several Western African countries with deserts or stroll around the streets of its capital Puerto del Rosario. Another thing you won't miss while on a trip to Fuerteventura are its thousands of goats which are said to outnumber human inhabitants and the many windmills. Windmills are remains of its rich grain farmland industry, which is demolished by many volcanic eruptions in the 18th and 19th century. Well known resort area's are Caleta de Fuste, El Cotillo in the north and Costa Calma and Morro Jable in the south. 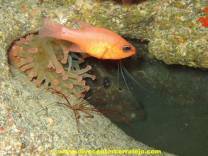 Diving is great in Fuerteventura because of a few reasons. One is its white sand which reflects sunlight very good and offers excellent corals and visibilities. Another is its shallow continental shelve which provides for many interesting and shallow dive sites just offshore. Last you can say that its wild volcanic history especially between Corralejo and Isla de Lobos has provided many different characteristics such as basaltic rocks, arches and caves. Corralejo and Morro Jable are the two main tourist areas, popular because of its many dive shops, daily diving, mild water temperatures and crystal clear visibilities. Well known species are dusky groupers, angel sharks, barracudas and parrot fish.